Students in the U.S. work with partner students from all over the world in Level Up Village courses. In addition to acquiring new STEAM skills, students are problem solving, iterating on each other’s designs and working together to propose solutions to real-world issues. Each course also includes opportunities for accleration. This convention, held from November 3-6, was a celebration of gifted children at all levels and from all backgrounds. We spoke to highly motivated parents, teachers, and administrators who are dedicated to providing quality instruction to meet their students’ individual needs. Moreover, they are interested in helping students become well rounded, successful people with a global perspective. 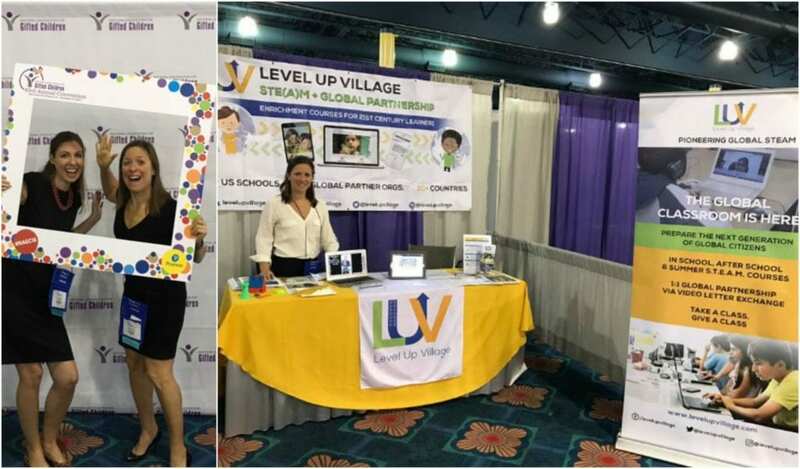 Global learning was an important theme at the conference, and attendees were thrilled to see the ways Level Up Village combines STEAM with global connection supported by technology. Here are some many ways Level Up Village meets the needs of gifted learners. Connections to global issues: Gifted students tend to be acutely aware of global issues and often times feel powerless to help solve them. LUV courses provide entry points for students to learn about global issues and work together with their global partners to propose solutions. Communication skills in a safe environment:– While gifted learners may be able to process information and learn new concepts quickly, many may struggle with communicating their ideas clearly. Level Up Village’s asynchronous video exchange with global partners provides a way for students to develop confidence when communicating. They even have the option to re-record their videos and take the time they need to articulate their ideas clearly and effectively. STEAM Focused: Cross-curricular learning opportunities are essential for helping students develop problem solving skills and work toward understanding how disciplines connect and overlap. Our STEAM courses do just that. In order to work through the projects, students must use a variety of skills in more than one subject area. This cross-curricular approach works well for gifted learners, who are ready to synthesize, make higher level connections and apply their learning. Opportunities for Acceleration: Each LUV course includes “Level It Up” activities or projects for students to extend their learning beyond the core lesson and work at their own pace. These experiences may include delving more deeply into a topic, creating a new project using course software in a different way, or taking action to address a community need. 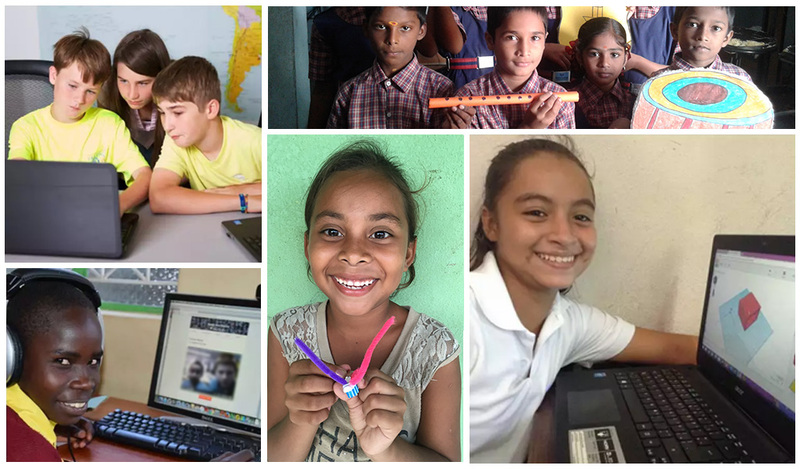 In Global Inventors, students learn computer aided design (CAD) and then co-design a solar-powered light source together with a partner student in another country. Global Inventors: What if you didn’t have electricity? 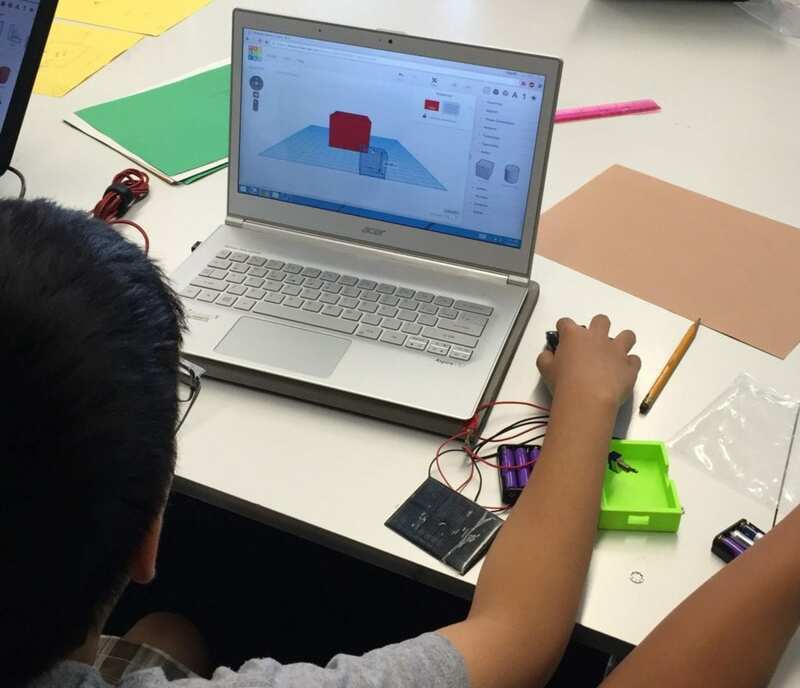 Students grapple with this question as they work through the Engineering Design Process to design and build a prototype of a solar light box with their global partner using CAD software. Global Scientists: Students dive into the chemistry of water to help them understand the global water crisis around the world. Through hands on experiments, students learn all of the important aspects of water that make it necessary for life on Earth. Global Web Designers: Combine web site design, climate change solutions, and global connections in our Global Web Designers course. Students learn the coding behind a website and design their own site focused on a renewable energy source – all in collaboration with their global partner. Parents: Talk to you child’s teacher, principal, PTO, or school board. Many of the schools we work with started as after school programs, so that could be a good place to start. Homeschool Parents- Get a group of students together and give us a call. Teachers and Administrators- Even if your budget is spoken for this year, we can help you find a way to pilot a LUV class that can roll out school-wide the following school year. Even if you think your school can’t afford it this year, LUV can help you find a way. According to the NAGC, “documented benefits occur for all children when gifted education strategies and programs are extended to other students.” This is important point to remember. While LUV classes are an excellent fit for gifted learners, they help all students develop as learners. Click here to request more information about LUV programs and how they could work for your students. Erin Dowd and Katie Cook represented Level Up Village at #NAGC16 in Orlando and had fun while doing so! In addition to being LUV’s Director of Curriculum, Erin is a member of NAGC and the Global Awareness Network; she also holds a teaching certification in gifted education.